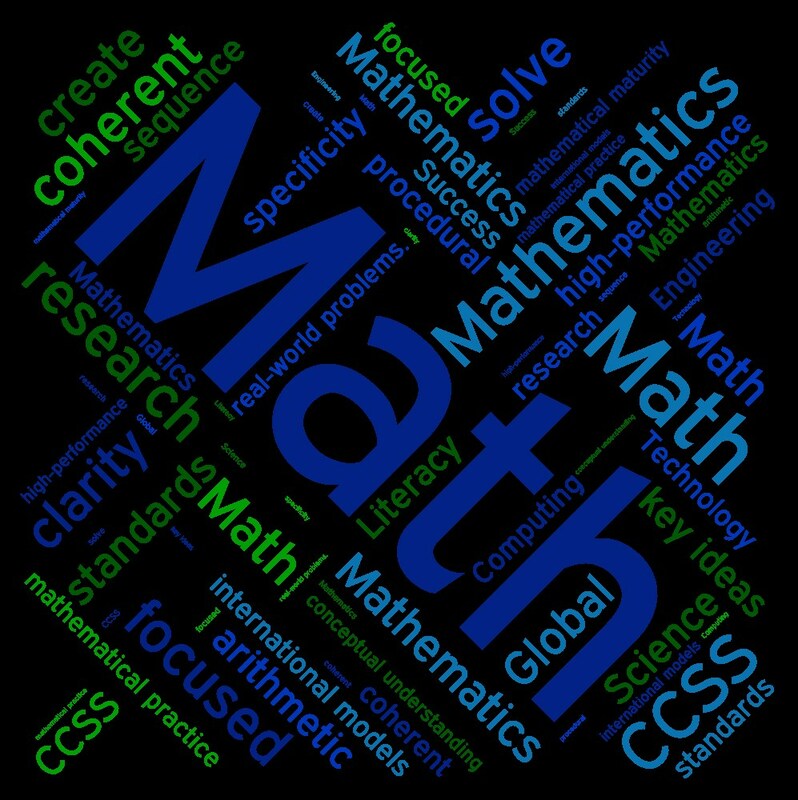 Possible math course sequences for grade 9, 10, 11 & 12 students: ALL STUDENTS MUST TAKE A MATH CLASS EACH GRADE LEVEL YEAR INCLUDING CREDITS IN ALGEBRA I, ALGEBRA II, GEOMETRY, AND ONE ADDITIONAL MATH COURSE). Algebra A - (1 unit) - This course covers two-thirds of the Algebra 1 content material of the State math framework. It includes properties of operations, variables, rational and irrational numbers, solving equations, ratios, rate and unit conversion, solving inequalities, an introduction to functions, linear functions, graphing linear functions and inequalities, systems of equations and inequalities, exponents and exponential functions, polynomials and factoring, quadratic functions and equations. AlgebraA/Algebra B should be taken in two sequential terms. Algebra B - (1 unit) - This course covers the last one-third of Algebra I content and the first one-third of Algebra II content. It includes radical expressions and equations, rational expressions and functions, data analysis and probability, expressions, equations, and inequalities, functions and graphs, linear systems, quadratic functions and equations, and complex numbers. AlgebraA/Algebra B should be taken in two sequential terms. Algebra C - (1 unit) - This course is the final course of Algebra A-B-C series. The course includes real numbers, equations and inequalities, functions and graphing, systems of equations, polynomials, rational expressions, radicals, quadratic functions and complex numbers, conics, polynomial functions, exponential and logarithmic functions, sequences and series, probability and matrices. Algebra II credit is earned in this course. Algebra IA – (1 unit) – This course covers one-half of the Algebra I content material of the state math framework. It includes properties of operations, variables, solving equations, polynomials, graphing, linear equations, rational and irrational numbers, and quadratic formula. Algebra 1A/Algebra 1B should be taken in two sequential terms. Algebra IB – (1 unit) – This course covers the last one-half of the Algebra I content. Algebra 1A/Algebra 1B must be taken in sequential terms. Algebra IIA – (1 unit) – This course covers one/half of the Algebra II content material of the State math framework. The course includes real numbers, equations and inequalities, functions and graphing, systems of equations, polynomials, radicals, quadratic functions and complex numbers, polynomial functions, and exponential/logarithmic functions. Algebra IIA/Algebra IIB must be taken in sequential terms. Algebra IIB – (1 unit) - This course covers the last one-half of the Algebra II content material of the State math framework. Content includes rational expressions, sequences/series, conics and polynomial functions, probability and statistics, and trigonometric ratios/identities. Honors Algebra A - (1 unit) - This course is the first half of the Algebra I curriculum intended for college-bound students who have an exceptionally high aptitude for mathematics. This course covers two-thirds of the Algebra I content material of the state math framework. It includes properties of operations, variables, solving equations, polynomials, graphing, linear equations, rational and irrational numbers, and the quadratic formula. Honors Algebra A/Honors Algebra B should be taken in sequential terms. Honors Algebra B - (1 unit) - This course is an Algebra I course intended for college-bound students who have an exceptionally high aptitude for mathematics. This course covers properties of operations, variables, solving equations, polynomials, graphing, linear equations, rational and irrational numbers, and the quadratic formula. Honors Algebra A and B must be taken in sequential terms. Honors Algebra B will also cover Chapters 1-4 in the Algebra II book. Geometry - (1 unit) - This course covers the study of two- and three-dimensional figures and concepts. Emphasis is placed on definitions, postulates, theorems, and deductive proofs as related to points, lines and planes. Geometry A – (1 unit) – This course covers the student of two- and three-dimensional figures and concepts. Emphasis is placed on definitions, postulates, theorems, and deductive proofs as related to points, lines and planes. Geometry A covers one-half of the Geometry content material of the state standards. Geometry B – (1 unit) – This course covers the study of two- and three-dimensional figures and concepts. Emphasis is placed on definitions, postulates, theorems, and deductive proofs as related to points, lines and planes. Geometry B covers the last one-half of the Geometry content material. Applied Mathematical Concepts – (1 unit) – This course is designed to prepare students for both college and the work place. Combined standards are from senior finite math and discrete mathematics. FOR SENIORS ONLY. Statistics – (1 unit) – Students choosing this course must have at least 19 on the math portion of the ACT. Statistics covers univariate and bivariate data, permutations and combinations, probability of compound events, discrete probability distributions, normal probability distributions, characteristics of well-designed studies, design and conduct a statistical experiment, inferences about a population based on a random sample, confidence intervals, and distributions. SAILS (Seamless Alignment and Integrated Learning Support) – (1 unit) – This course is open to rising seniors who are not yet ready for college-level math (placement based on ACT math subtest). This class gives you a great opportunity to eliminate the need for remedial math when you go to college and will allow you to master the math competencies needed to be successful in college math while at the same time earning your high school bridge math credit required for graduation. You will be working in a computer lab in your high school with the support of your high school teacher/facilitator, a coordinator and the community college faculty and administration. This program is totally free and will save you time and money in your college studies. You may also elect to take an actual college-level math class in the spring semester after completing your learning support math in the fall. Honors Statistics - (1 unit) - This course is taught for college-bound students who plan to take Calculus as a senior. Statistics covers univariate and bivariate data, permutations and combinations, probability of compound events, discrete probability distributions, normal probability distributions, characteristics of well-designed studies, design and conduct a statistical experiment, inferences about a population based on a random sample, confidence intervals, and distributions. Pre-Calculus - (1 unit) - This course is to prepare college-bound students for a first course in Calculus or College Algebra and Trigonometry. Algebra and analytic geometry are integrated with other important topics in mathematics by an approach, which emphasizes functions. Separate topics include polynomial, circular, second-degree relations, transcendental functions, and introduction to limits. Pre-calculus concepts of limits, derivatives and integrals are considered from an elementary viewpoint. Honors Pre-Calculus - (1 unit) - This course is taught for college-bound students who are planning to take AP Calculus as a senior. Algebra, trigonometry and analytic geometry are integrated with other important topics in mathematics by an approach, which emphasizes functions. Topics include polynomial, circular, and transcendental functions. Pre-Calculus concepts of limits and derivatives are covered from the AP Calculus Book. Calculus - (1 unit) - This senior math course will explore concepts of calculus including limits, differentiation, and integration. This course does not prepare students for AP testing. Honors Pre-Advanced Placement AB Calculus – (1 unit) – Students begin to explore concepts of calculus while developing a deeper understanding and application of trigonometry standards, derivatives, and limits. Advanced Placement AB Calculus - (1 unit) - [May be combined with Calculus above] - Students explore concepts of calculus in curved space, variable rates of speed, irregular paths, and areas of regions with curved boundaries. Extensive study of derivatives, integrals, limits and sequences including formulas and proofs are also covered. All Advanced Placement AB Calculus objectives are included. Honors Pre-Calculus/Honors Pre-Advanced Placement AB Calculus/AP AB Calculus should be taken in three sequential terms. Honors Post Advanced Placement AB Calculus – (1 unit) – This course is an extension of AP Calculus in which abstract calculus concepts and theorems are covered. Formulas and proofs of sequences are examined. Time is spent studying the style and format of AP exams including times settings.